Have you ever noticed how much the different seasons can affect life? Oddly enough, the seasons affect more than just the weather. They can affect things like the stock market as well. If you look closely, you’ll find that the market’s performance can be dependent on not only the time of year, but the days of the month as well. Just as you go through various seasons of life, so does the stock market. The market follows money and where the money goes, in many cases, depends on consumers. Reasoning behind patterns and seasonal changes aside, if you can begin to recognize these patterns and events of seasonal change, you may be able to use them to your financial benefit. Here are six ways the stock market undergoes seasonal change and how you can utilize seasonal investing to your benefit. Many savvy investors look to claim capital losses at the end of the year to offset any gains they may have received for their taxes. To do so, many review their portfolios and sell any stocks that have declined throughout the year. That being said, December tends to see an influx of stocks being sold, which means if you have any plans to sell, you’ll be one of many attempting to unload less than great funds. Use this particular trend to your advantage by beating other investors to the punch and selling your tax losses sooner rather than later this year. After the holidays, the prices of certain stocks (small cap and value to be exact), tend to be pushed upward significantly. The reason for this is that most investors return to a new year with vigor, which causes the prices to increase. While this mostly affects those small cap and value stocks investors are pushing, it can affect the whole equity market as well. So, how can you benefit from this particular trend? Purchase small cap or value stocks at the end of the December, and you might see the prices of your purchases rise significantly come January. The changing of months brings about a few patterns in trading. One in particular at the turn of the month refers to the often-seen pattern where stocks rise at the beginning of the month and tend to fall somewhere in the middle of the month. 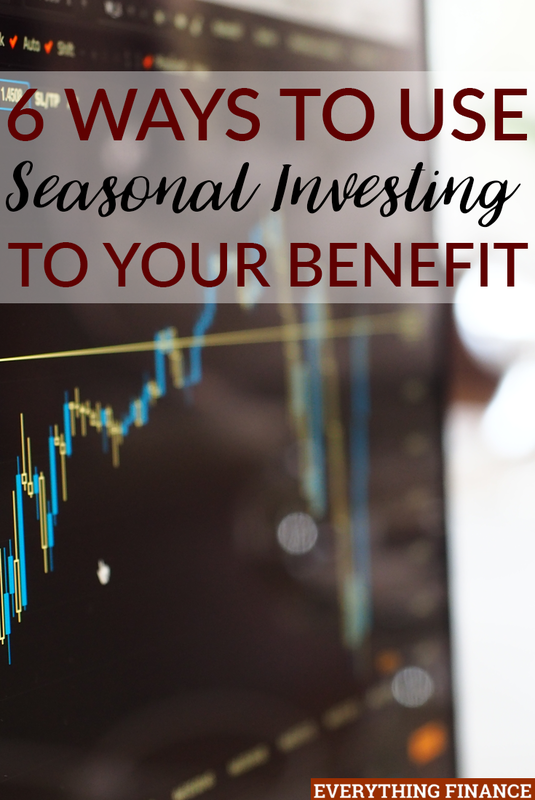 Using this seasonal investing trend to your benefit is easy. If you plan monthly, instead of making contributions at the beginning of a month, make them in the middle. Another smart monthly investment is called the first day of the month trade. By utilizing this idea, you put yourself in the market for only one day of each month, and are in cash for the remaining days. However, you should be careful when putting this idea to use, as it doesn’t hold in every market, and you should still pay attention to more encompassing analysis and trends. Mondays tend to have a funny effect on everyone. The first day of the week is often difficult for lots of people. Interestingly enough, it’s a hard day for the stock market as well. The market tends to drop come Mondays. Whether this is due to investors’ Monday moods or news that may have been released over the weekend is unclear. On average, you won’t see the market peak on a Monday. That being the case, if buying stocks was on your to-do-list, Monday is most likely the best day to shop. Unless you happen to be Ebenezer Scrooge, most people tend to be happier and more optimistic during the holiday season. Optimism throughout the general nation tends to cause the stock market to rise as well. Usually, in the case of a large holiday, such as Thanksgiving, Christmas and Independence Day, the stock market will see an uptick in direction. Due to this particular trend, it could be beneficial to purchase stocks close to a holiday period. While this does have the potential to be beneficial, it’s worth noting that the transaction costs could outweigh some of the benefits. Be sure to do your research before using this pattern. Every time of year has its ups and downs. In sales, there are certain items that you know do better during various times of the year, and if you’re a consumer, you know that certain items will have their best sales during certain months of the year. The stock market follows a similar trend; there are months where it’s at its best and months when it seems especially lackluster. Don’t expect May through October to be overly beneficial for your portfolio or your finances. This is especially the case for the months of May, June, August and September. On the opposite end of the spectrum are the months from November to April, which tend to perform quite strongly. The one exception to this rule is February, which doesn’t see strong performance. A change of seasons brings more than just weather. The time of year also has a tendency to affect people’s moods and actions. Think about it. During the Thanksgiving and Christmas seasons, for the most part, people are generally in happier, kinder moods. Human nature can have an effect on so many other aspects of our society, and money is one of those things. Our moods can change the way we look at spending money and investing, which is why the stock market sees seasonal changes as well. While you should still take the time to carefully examine market trends and do your research, there may be a few seasonal patterns worth taking into consideration. Watch for these patterns yourself, or ask your financial advisor for their opinion, and see how you can incorporate them into when you invest or sell. You may find that they’re beneficial to your finances. Do you follow season market trends? Have you tried seasonal investing?